An older fez. 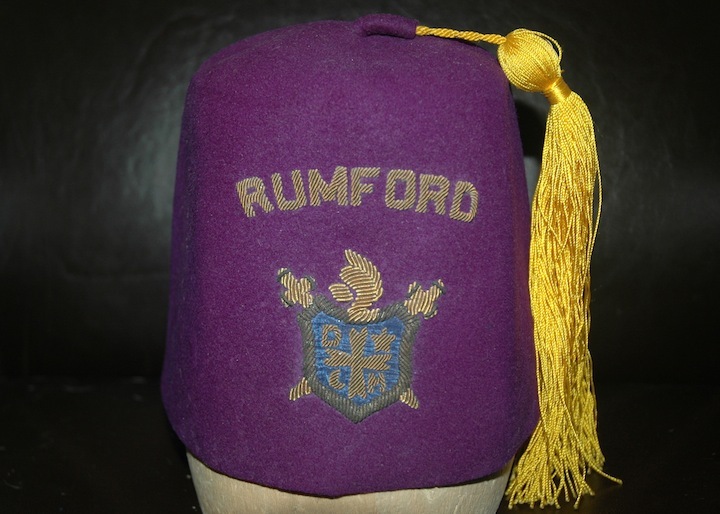 Emblem is embroidered onto felt and then stitched to the fez. Remnants of an old adhesive label up inside the top of the fez printed with Arabic writing, may suggest that this fez was imported by Lilley Co and then specialized and decorated here in the states. Has been stored in a cloth bag, appropriate to the era, and thus is very soft and crushed, but remains in good condition. 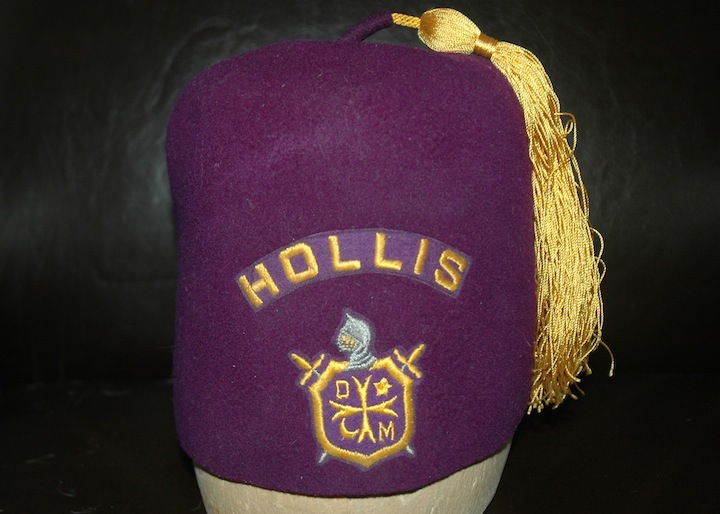 A purple wool Scottish Rite style hat with a DeMolay emblem on it. Gold tone piping around a band, with the DeMolay emblem as it existed from 1920 to 1932 as a patch applied to front center. Interior is left wool, no lining, with leather sweat band in good condition. A small label on leather band reads “7” for the size. As it is purple, it is almost certainly a Master Councilor hat. An identical piece can be seen on display at the DeMolay museum at HQ. 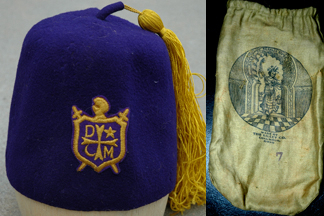 Seth Anthony pointed out in an email that, throughout DeMolay history, when different Masonic bodies were particularly in support of the group, the officers’ hats tended to take on a form familiar to that body, thus fezzes, crowns, prayer hats, etc. have come in and out of use over the decades. Chapter name, “HOLLIS”, and the emblem (shield, swords, helmet, cross, crescent, star) are embroidered on a thin felt patch and stitched on. Emblem is the 1920 revision, which synchs with the style and timeframe for fezzes being worn by DeMolay officers. Yellow tassel is tangled and messy, but fully intact and clean. Interior, maker’s label from M. Helfter’s Sons in Brooklyn, reinforces the probable location of this chapter at Hollis, NY. Chapter appears to be extinct. Chapter name, “RUMFORD”, and the emblem (shield, swords, helmet, cross, crescent, star) are embroidered in multi-colored metallic bullion. Blue background of shield is blue silk. Emblem is the 1920 revision, which synchs with the style and timeframe for fezzes being worn by DeMolay officers. Yellow tassel is tin reasonably good repair, if lightly soiled, lightly frayed at end. Interior maker’s label from Boston Regalia Co. Uncertain location of this DeMolay Chapter. Currently there are Chapters in both New Hampshire and Maine with the name Rumford, and for that matter this could hearken back to another Chapter entirely that could be extinct.